At the beginning of the year, I decided that one random goal of mine was to make a blanket. And as much as I like to think I'm handy enough with my (dusty old) sewing machine, and as much as I'd someday love to learn how to quilt, I figured out that crochet may be more up my alley. 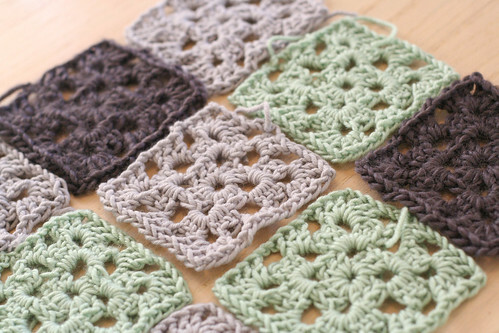 After working on a few random pieces (and kind of making up the stitches as I went along, apparently), I decided to buckle down and actually learn how to make a granny square. My first granny square was all warped and depressing. It was the granny square from hell. I did not take a picture. Except the one in my mind, which haunts my dreams. (Did I mention I'm a wee bit dramatic when it comes to failing at things? Well, there you go.) I quit trying to figure it out for a few weeks, because I was so annoyed with the whole thing, but I had some pretty yarn staring me in the face and after a while I couldn't ignore it. I picked it up again, and somewhere along the line I figured out I was doing my double crochet incorrectly. I did a few google searches for left-handed crochet tutorials, and once I figured out the right way to do things, I was in a much better place. 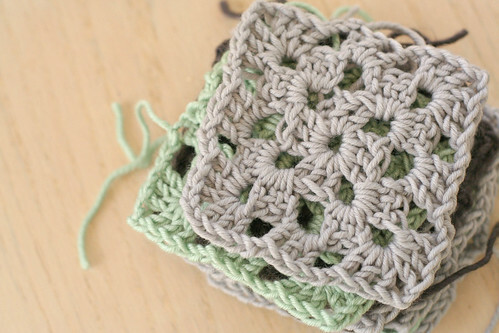 I found this tutorial on making granny squares, and my first one turned out quite nicely. Hurrah! After several days, I had a nice little stack of squares happening. I can do them so quickly now that it's a nice, calm activity to focus on throughout the day—that is, whenever I have a few minutes to myself. I chose this color combination because it seemed neutral enough to put in my living room without being the only thing that stands out, and modern enough not to feel old-lady-ish. But now I feel like I want to add a punch of coral or something. I'll probably keep in bluesy tones, but we'll see. Maybe I'll get bored and want to mix it up. I'm using two slightly different types of yarn, so at this point I'm not even sure it will come together to be a functioning blanket (is there such a thing as a non-functioning blanket?) but it's worth a try. If anything, it's a good first "real" crochet project. Regardless of how it turns out, I'm proud! yay! love! i adore that we are embarking on crochet together. :) now if only we close enough to sit together and crochet and drink a mocha frap... because that sounds heavenly. I'm actually doing the very same thing! I'm about halfway through. I'm even doing the same sized squares which is funny! A few tips though. It goes so much faster if you focus on one color at a time. Switching makes it seem like it's taking forever. I love the colors you chose and I wish you luck with your project! SWEET! I love the colors (what yarn is it?)... I am working on a blanket myself right now. 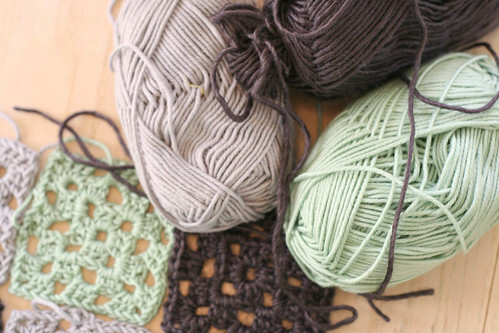 Isn't crocheting the most relaxing (and rewarding) thing to do? Thanks, lady! :) The blue and green yarns are both acrylic wool blends by Martha Stewart Crafts (purchased at Michaels) in green eucalyptus and gray pearl, and the dark gray yarn is Vicki Howell Sheep(ish), although I forgot the exact color of that one (oops!). 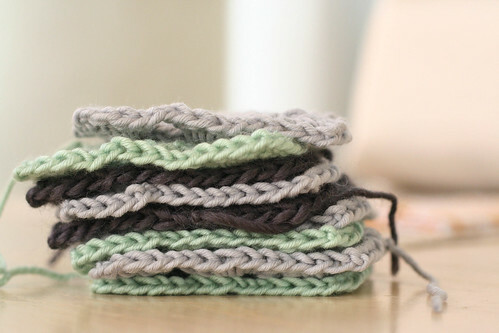 I wish I knew how to do to *anything* with yarn (besides wrap a package). It could quickly become an obsession there are so many beautiful yarns to choose from. I think you choose wisely - I love the colors! Good job! Your squares look great! I'm currently making a blanket with the same yarn and I really like it ;) Crochet is the perfect excuse to watch tv, I find. If you're looking for patterns to expand your crochet skills, I've had success teaching myself some from purlbee.com (LOVE Bear's Rainbow Blanket, which I'm currently making) and it's easy). Keep up the good work; can't wait to see the finished product!! I love to crochet- and am hoping to learn to knit soon (its so intimidating!). Both of my boys have crocheted blankets I made for them, and little Ben's is a giant granny square. It was so easy and relaxing to work on :) Keep up the good work, you'll feel so satisfied when you use that blanket, knowing you made it! Giant granny square? Like one monster-sized granny square? I LOVE THIS! I love crocheting... this reminds me of my grandma though. For every one of her grandchildren (and there are quite a few of us! ), she has crocheted a double bed-sized blanket in our favourite colours as a leaving home present, to keep us warm through the student and penniless-young-adult years; she's a pretty awesome woman. I really like the green you use - what wool is it? The story about your grandma makes my heart all melty. What an incredibly thoughtful gift for her grandkids—and something that you can all pass along to your own youngsters someday. :) Such a sweet idea! Beautifully done! What a great project to start. And don't be afraid of quilting - it's a hobby my mom has done for years and I just started and it's easier than one might first imagine! Thank you for sharing your work - it's great! Knowing that you are a fellow lefty only makes me love you more. Sometimes it is so hard being so special. i always wished i knew how to knit. my aunt tried to teach me once but my brain couldn't handle it lol. i'm impressed! I am always jealous of people who can do things like this. I need to acquire such skillz. One day. I love that color combination, too.